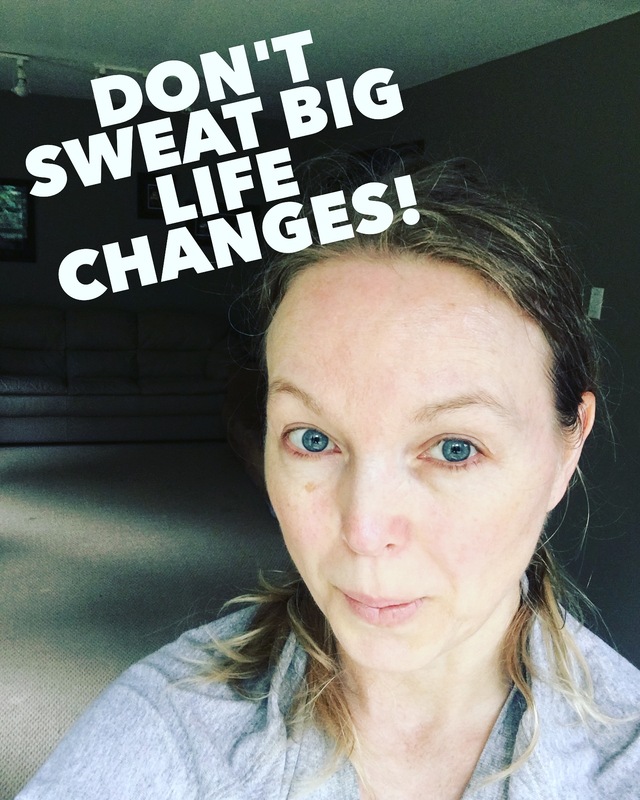 I got a great sweat on this morning with a yoga and Pilates continuous movement combination work out… It was really tough but I felt great and was dripping sweat afterwards… I never really thought that I would enjoy this type of exercise, but I’m finding out that it is really improving my health and I’m totally loving it!! September is approaching and I don’t know about you, but I find September is a great time of year to start new things, develop my knowledge, and get creative by implementing new things into my life. I have always felt this way I guess because September is the start of a new school year and it’s just a great time to start implementing change. Some people get nervous about making changes but it truly is exciting if you make yourself do things outside your comfort zone! Starting in September, I plan to implement a completely new diet regimen, a new exercise plan, and as well implement a new and exciting career in providing healthcare services with my own business. I am adding this to my already existing health business where I help people with fitness, optimizing their nutrition and lifestyle change as a coach … It is all just very exciting …even though it can be scary at times, I am pushing through the fear! Make September the decision time to make a change in your life! Take a course! Start a new health plan! Revamp your financial plan! Dig into that relationship you have been afraid to take to the next level! Make a career change! Start a new business! Do something to make fall time exciting! It makes the transition to winter much easier when you are feeling fulfilled, energized, healthy, happy and passionate about something you love! FYI… My job as a FREE coach is to help you select the health program that will best help you achieve your goals… Be sure to contact me to discuss! I remember those days when I only did things when I felt like doing them. It really didn’t do me any good since I was 40 pounds overweight and miserable. Learning self-discipline has been the key to success in all areas of my life. Self-discipline is doing things because you know you need to even if you really don’t want to. This morning, I really didn’t feel like getting out of bed at 430 am, but I pushed myself downstairs to get it done and definitely no regrets! TO download FREE… 7 tips to improve your self discipline, enter your email address HERE! Working Out for Beginners (and Grandmas), and the surprising way it will change your life. …to be healthy and fit feels great and is worth the work! Thinking of working out, but you’re a little afraid? Think you’re too weak or too old or too lazy, but you want to at least give it a try? Then I want to quickly tell you how it’s going to change your life. I mean even in your everyday stuff. I’d also like to give you a bit of direction about how to start. The first thing many want when they start on their fitness journey is to look different. Thinner, smaller, tougher, lean. And that may happen, but you need to know right at the start, you’ll get much more out of it than just looks. Your energy will increase. Assuming you’re eating clean and getting enough calories, the adrenaline and other hormones released into your body by exercise will affect your energy. Your body will work better. Exercise affects you even at a cellular level. When you’re active, the body will use food more efficiently, and many parts – like the thyroid, endocrine system, pancreas, digestive system – will all signal and function better as a result. It’s pretty amazing how movement (or non-movement) affects the body. You’ll feel better. Client after client has reported feeling more positive, less depressed or lethargic, more motivated and a feeling of being more capable. Exercise improves mental and emotional health, not just physical. You can do more normal stuff. I’ve noticed this in my own body. Since I began working out, I can do a lot more on my own. I can bring in all the bags of groceries by myself without huffing and puffing afterward. I can shovel snow without pulling a muscle. My joints are stronger. And, if I need to move the couch or fridge, I can do it easily on my own – all important things for a single grandma! It’s a bit tough to say where to start, because it really depends on where your body is at. A person recovering from back surgery or a teenager will need a whole different routine than an overweight mid-forties woman who’s otherwise healthy. It’s always best to get the personalized advice from a coach who can advise you based on your specific needs and fitness level. (I can help with that) So please take the following not as specific personal advice for you to follow, but more as a general guideline. That said, it’s often best to start slow. For a few reasons. If you’ve been especially sedentary or have health issues, this is especially true. A good beginning for you might be to stretch daily or every other day, and go for a walk or bike ride. Keep it light to start – pushing too hard right off will only destroy your motivation and invite injuries. The next stage would be to increase intensity by either lengthening the time of your walk or bike ride, or increasing the difficulty, perhaps by traveling uphill or going faster for portions of the workout. A person could also add a cardio workout routine or consider joining an accountability group! Click HERE to ask how! Most people stop there, forgetting to add the vital element of weight lifting (resistance training). Wait ladies – before you envision giant barbells and bulging muscles – that’s not what I mean. Not at all. Here’s the truth about muscles. If you don’t make them work, they weaken. They weaken a lot and actually shrink (atrophy), becoming nearly useless. A lack of exercise leads to atrophy of skeletal muscle, which essentially leads to a smaller number and size of the muscle cells! Just so you know, lifting doesn’t have to be this big, demanding ordeal. I’ve been working out for years, and only lift 2-3 times a week. The rest is cardio. It doesn’t take huge amounts of time to get results. It may suit you best to start out with smaller weights (3-5 lbs) even once a week, and work up to 10 or 15 as you gain strength. The bottom line: if you don’t use your muscles, they’re going to leave you. You need them. Work them. Even just a little at first. Starting small is okay. The important thing is that you start. To get tips about getting started on clean eating, click HERE. To join the athletic grandma community, enter your email address HERE and get a free download about how to improve your self-discipline! 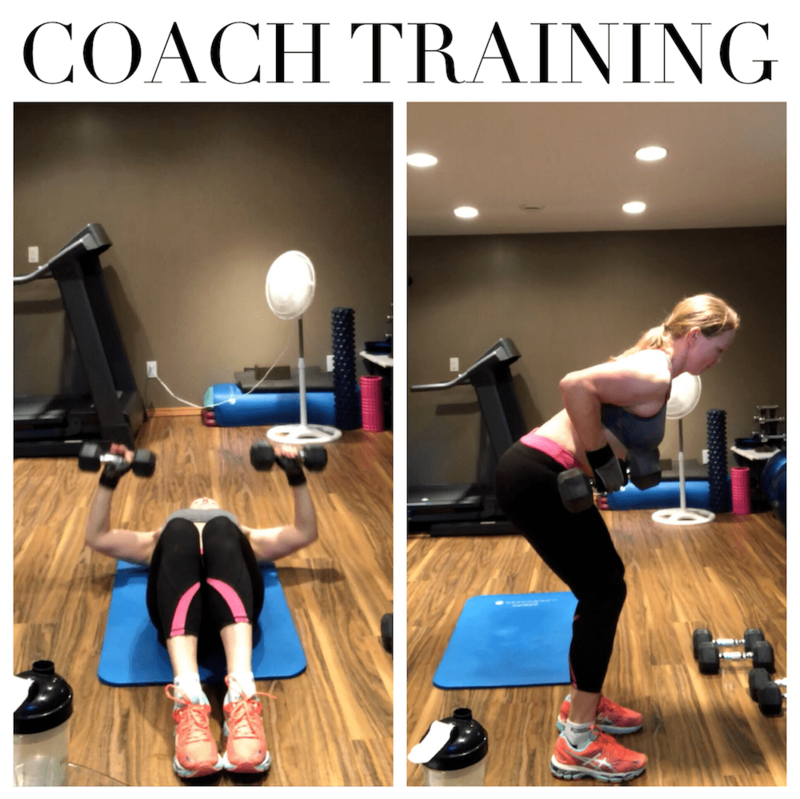 Author fitnessgal1969Posted on January 31, 2017 March 9, 2017 Categories GoalsTags beginner, coach, exercise, fitness, grandma, how to start, learning, muscles, nutritionLeave a comment on Working Out for Beginners (and Grandmas), and the surprising way it will change your life. New Year, New You, Now is the time to Get Started! The New Year is here (can you believe it is 2017… wow!) and Summer is right around the corner, seriously, it is! That is how fast time flies. But the good news is… you are in the drivers seat of your life! There is no time better than right now to start your journey. But in order to tackle these crazy tough Beachbody workout routines, you need to arm yourself with the right tools to guarantee your success. Not going to lie to you, whatever program you are attempting, the work is hard and the commitment is relentless but the rewards that follow are so amazing, so grand, so epic! The time to start is now and I am here to help you achieve that success you desire and those results you absolutely deserve! My name is Diane Gudmundson and I am a Team Beachbody Coach. My journey started two years back when I was 45 years old. I had just topped the scale at 196 lbs. for my 5’8″ frame. Being out of shape was only the tip of the iceberg. I was unhealthy and was on medications for anxiety, body pain and sleeping issues. My hair was falling out, my skin was dry and flaky, and my nails were cracking and peeling. My gut was not functioning properly, I was having pain when trying to use the bathroom with bleeding and even was having difficulty peeing! I was a mess! My doctor gave me a good physical examination, arranged numerous blood tests and a colonoscopy. It was found that my blood results were normal, the colon was 100% normal The worst part, through all of this, was that I had lost all my self-esteem and confidence. All this at 45 years of age! So, if all my tests and examinations were normal, what did this mean? This definitely was an aha moment! The first step of my journey was to find a nutrition plan (not a diet) that was going to work for me and work for the rest of my life. I love to eat all kinds of food, and I was not going to deny myself one of life’s most pleasurable experiences. Avoidance was not an option, limitation and moderation was how I would succeed. I studied clean eating and portion control and with a simple weekly plan implemented clean eating into my life. I also knew I needed to incorporate an exercise routine. I choose P90x as my first program. Now let me just reiterate how out of shape I was. I couldn’t even go up a flight of stairs without getting winded, I could only do a couple pushups on my knees (barely) and could not last more than a few minutes when trying to do jumping jacks! I had aches and pains constantly, back and knee pain, and really was poorly motivated to do any physical activity. When I went horseback riding, my back pain got even worse, so I lost my motivation to go riding as as result! I was not going to give up hope! When I popped in that first workout DVD in on Day 1, I barely was able to do any of it. But I knew if I just made tiny improvements each day, just little baby steps, I was putting myself on the right path towards success. I could sit here and tell you that it was easy, and that all it takes is a bit of willpower and go for it. Well, it doesn’t work that way and it has absolutely nothing to do with willpower. Changing your lifestyle, changing your body, changing your mind and the way you think, changing almost everything about yourself (including limiting beliefs and emotional issues) in order to reach your goals is going to be the toughest thing you will ever attempt in your life. I struggled, I failed, I hit obstacles, but these difficulties are all required, this is what makes it the greatest journey in the world. If a path is easy, it does not build our strength and capacity! I could not have done it alone though and needed all the support that I could find. I found a Beachbody Coach and then participated in an online Accountability Group. I can honestly say that if I hadn’t done this important step, I would never have succeeded! Since completing that first then second round of p90x, I went on to complete Focus T25, 21 Day Fix and 21 DF Extreme, PiYo, Insanity Max 30, Body Beast, P90, 22 min hard corps, and Core de Force! I am loving this because I never get bored and, by switching up my fitness programs regularly, I am getting optimal results! Currently I am doing a mix of Core De Force and The Master’s Hammer and Chisel which has now become my all-time favorite program combination! Much Happier and now 42 pounds less!! Healthy, Happy and energized for life are three ways to explain how I now live. Now, I want to give back, pay it forward, and share that experience with you and share all that I have learned. If you are ready, ready to make that change, ready to learn, ready to arm yourself for battle, ready to be motivated, ready to be inspired, ready to be accountable, ready to own it and earn it, then I will do everything in my power to ensure you cross that finish line and find success in all your goals. Take a minute to consider BOTH of these options! To join an online accountability group with me as your coach, please take a few minutes to fill out the application here. Please COMMENT with your thoughts below! Author fitnessgal1969Posted on January 3, 2017 Categories GoalsTags accountabilty, change, coach, determination, fitness, health, motivation, new year, support, time for change2 Comments on New Year, New You, Now is the time to Get Started! I must say that today is an interesting and thought-provoking Wednesday. I was listening to my mentor Darren Hardy this morning, and… he was talking about what it takes to achieve greatness. He was saying… It’s not necessarily what we do for a living or do each day that makes us great, but rather the exceptional effort that we put into it that’s above and beyond average. So no matter if you’re a nurse, a doctor, a grandmother, mom, a teacher, a caretaker, a computer programmer, Lab technician, a friend, a coworker, coach, etc… None of these titles make us great. What makes us great is the amount of passion and effort you put into these roles in our life. For example if you mindlessly punch the clock or wake up every morning and begrudgingly do the bare minimum, does that make you great? If you perform your duties or work with vigour and passion, go the extra mile, and give it 110%, does that make you great? Author fitnessgal1969Posted on June 22, 2016 Categories GoalsTags coach, Exceptional, grandma, greatness, health, interesting, passion, personal development, WednesdayLeave a comment on What makes someone great? Now THIS is something I have never done before! 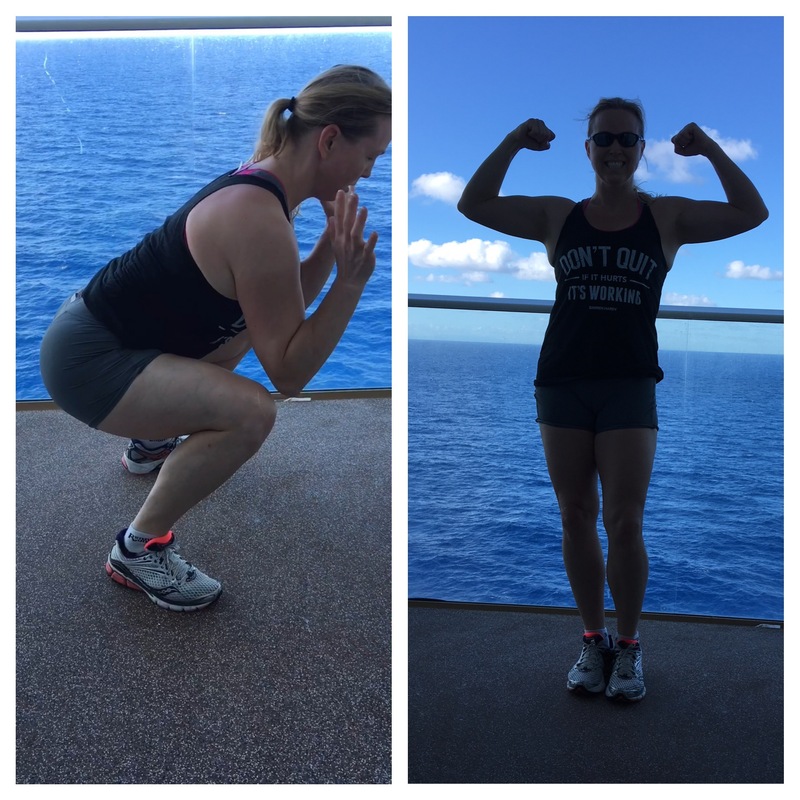 Frog Burpees with Tony Horton as I am sailing through the Caribbean seas!! These are tough to do and doesn’t take long to get out of breath! Once I completed this workout today, I was feeling incredibly good! HEY, even if you are super busy or on vacation, who can’t fit a 22 minute workout into their day? Once I get back to Manitoba, I will be setting up a free clean eating bootcamp then will be starting both a boot camp and 21 day support and challenge groups on Mar 28th! Are you interested in joining me!? Comment below or message me privately if you want in!! Like my shirt says…”Don’t quit…if it hurts it is working! !” It’s so true! Don’t give up on yourself! It’s hard to change from our old ways but getting OUT of that rut is fun and rewarding!